Daf yomi is the discipline of learning a page of Talmud a day. 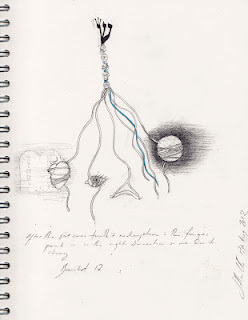 Draw yomi is an on-line project to follow the daf yomi cycle and to respond each day with a drawing. Conceived by British artist Jacqueline Nicholls, one can follow her process here. In addition, each week she invites a chavrutah, a learning partner/friend, to add their voice to ongoing Talmudic conversation. Nicholls is also the co-founder of the newly established London Jewish Artists Salon. For more info on her other art projects, visit her website.